This summer, turn your child into a nature lover and get him excited about exploring the outdoors with the help of some cool GeoSafari tools from Educational Insights. First, he'll need a set of GeoSafari Compass Binoculars to help him see where he's going. They're perfect for camping trips, nature walks, and in-town explorations. While he's out and about, he can use his new Outdoor Adventure Kit to watch insects munch leafy meals, examine camouflaged critters, and gather specimens for further observation. Once he's done, the built-in compass on the binoculars will help your young Indiana Jones find his way safely home. 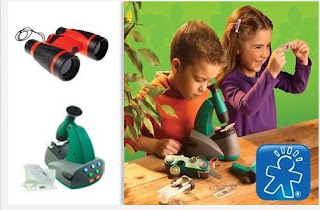 Then it's time to take out his Talking Microscope Kit to see nature up close. Your child will enjoy hours of exploration and outdoor fun! That's $70 worth of learning and discovery, and your little one can have it all for just $42 with this week's Savvy Offer. Take advantage of this deal today and let the adventures begin. Shipping is not included in price of offer. Shipping price is $8.95 per order. Merchant WILL NOT ship to outside of the continental US or to P.O boxes. Coupon cannot be combined with any other coupons, discounts, or promotions. Coupon is transferable and can be purchased as a gift. Limit 5 per order. Coupon is of no cash value.